With a comical theme and frequent bonus rounds, this five-reel, 20 pay-line game delivers a lot more than 'chicken feed'. Cash-A-Doodle-Doo pays for three, four, or five identical symbols in a row, left to right or right to left. Players are taken inside the Chicken Coop during the bonus round where they are prompted to pick from a nest full of eggs, each hiding a different bird symbol. 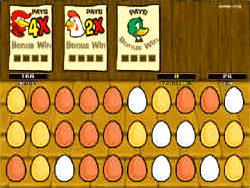 Once the player chooses four of the same bird, the sum of all their prizes is tallied and multiplied by a corresponding bonus multiplier shown on their bird's tally board. Available in a 20-line configuration with maximum credits of 100, 200, 400, 500, and 1000. Denominations are available in 1, 2, 5, 10, 25, and 50 cents, and 1, 2, 5, 10, 20, and 25 dollars. Five denominations are available at one time.